The yen to dollar pair squeezed higher again on Friday, following Thursday’s bullish engulfing signal, ending the session with a narrow spread up bar but with deep shadows to both the top and bottom of the candle. Much of the volatility in the forex market followed the release of the Non Farm Payroll numbers, which whilst not surprising the markets, did offer a degree of conflicting evidence as to where we were in the economic cycle, and as a result the time that the recovery will take to get into gear once again. Whilst the actual numbers were marginally better than expected the jobless percentage continues to grow, suggesting that major companies are unlikely to rush into full scale recruitment until the corner has been well and truly turned. As a result the markets oscillated back and forth on Friday following the news, with the yen and dollar counterbalancing one another as risk appetite and risk aversion ebbed and flowed following the news. 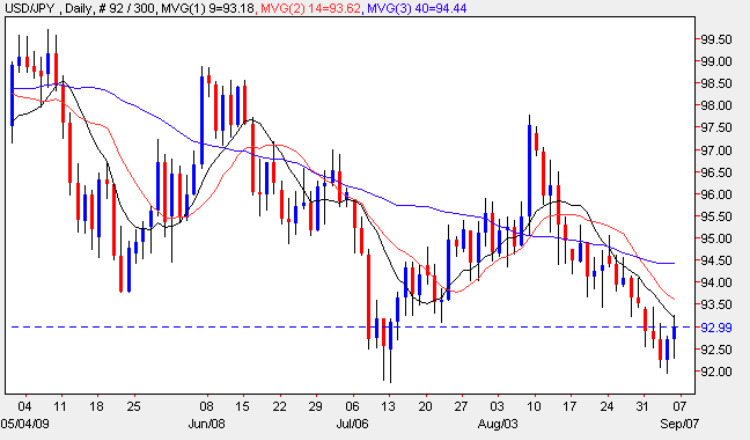 The only technical point we can draw from Friday’s price action on the daily forex chart is that the high of the trading session found some resistance from the 9 day moving average, suggesting that the rally may only be a short term squeeze higher, rather than any longer term move upwards. With no fundamental news on the economic calendar for the US due to a national holiday, and with none scheduled for Japan, today looks like being a quiet day for forex traders on the yen to dollar pair.